In the end, AzhwAr says “Those who learn with their hearts this decad, which enlists emperumAn’s victories, will be granted victories by this decad itself”. AzhwAr remained united with and having the same nature as the bhAgavathas who are distinguished servitors for krishNa, the great benefactor, who lifted gOvardhana; those who practice with the meanings, such AzhwAr’s this decad among the thousand pAsurams, which is having the goodness of revealing the victories of sarvESvaran, will be granted victory in every aspect, by this decad itself. kunRam eduththa … – AzhwAr becoming pleased being together with the bhAgavathas who are engaged in emperumAn’s quality of lifting up the gOvardhana hill, and the beauty at that time, recited this pAsuram as an outlet for that joy. nanRi punaindha Or Ayiram – The thousand pAsurams which classified sarvESvaran’s parathvam (supremacy) and saulabhyam (simplicity). nanmai (goodness) means telling the samsAri (materialistic person) that emperumAn is the sarvESvaran, he is easily approachable by all and he is the refuge for all; this is what has been mercifully explained by AzhwAr from the first decad. This decad which enlists the victories of sarvESvaran. mEvik kaRpArkku – venRi tharum – This decad will grant victories to those who learn this with great attachment. 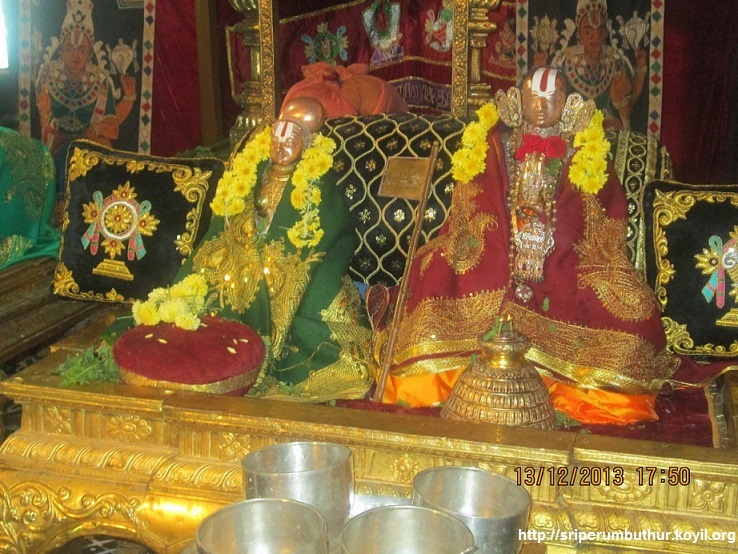 For aiSvaryArthi (those who seek wealth), it will eliminate the hurdles for acquiring wealth; for kaivalyArthi (the one who seeks self-enjoyment), it will eliminate the hurdles [in that pursuit]; for bhagavath charaNArthi (those who seek bhagavAn’s divine feet) – for upAsanka (one who pursues karma, gyAna or bhakthi yOgam), it will grant control over senses; for prapanna, it will grant victory over hurdles in performing kainkaryam. This entry was posted in thiruvAimozhi, thiruvAimozhi 7th centum on September 2, 2018 by Sarathy Thothathri.